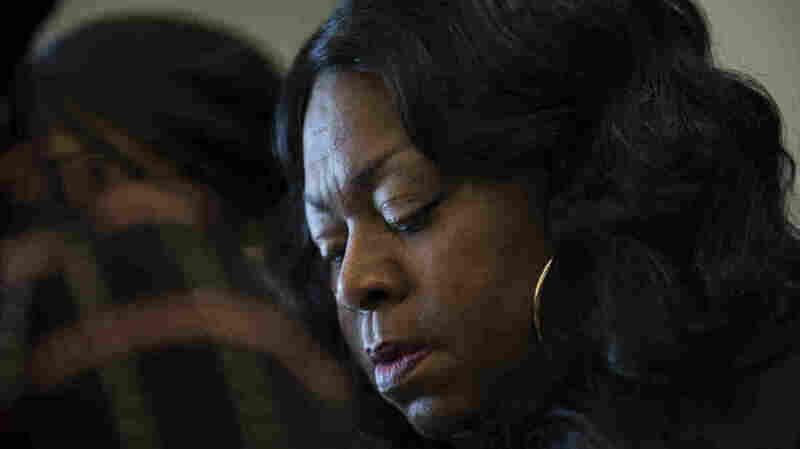 Philando Castile's Mother Reaches $3 Million Settlement Over Police Shooting : The Two-Way The city of St. Anthony, Minn., said in a statement that "no amount of money could ever replace Philando." It said the deal was reached quickly "to allow the process of healing to move forward." Valerie Castile, mother of Philando Castile, listens during a November 2016 news conference in Minneapolis. On Monday, she reached a near $3 million settlement from the city of St. Anthony, Minn., over the killing of her son by a city police officer. The mother of Philando Castile, a black motorist who was shot to death by a police officer last summer in Minnesota, has reached a settlement deal in the city of St. Anthony worth nearly $3 million. "No amount of money could ever replace Philando," the Minneapolis suburb said in a statement. Officials in St. Anthony said the settlement was reached quickly "in order to allow the process of healing to move forward for the Castile family, for the people of St. Anthony Village, and for all those impacted by the death of Philando Castile throughout the United States." Valerie Castile will receive $2.995 million through an insurance trust, according to the city's statement. The settlement, which must be approved by a state court, will avert a federal wrongful death lawsuit in the Castile case, according to The Associated Press. "The important work of healing our community continues," St. Anthony said, adding that "the City and residents are working to improve trust between the police department and the communities it serves." St. Anthony is taking part in a Justice Department program aimed at advancing trust and respect between police and those they serve. The killing of the 32-year-old school cafeteria worker sparked a national outcry and mass protests after his girlfriend, Diamond Reynolds, broadcast the shooting's aftermath on Facebook Live as Castile sat dying in the driver's seat. Reynolds was in the passenger seat and her 4-year-old daughter was in the back seat when Officer Jeronimo Yanez stopped Castile for a broken taillight on July 6, 2016.
" 'I'm not pulling it out,' Castile responds. "Yanez fires seven shots into the vehicle. Five hit Castile." Castile had a legal permit to carry the gun. The dashcam video — shown in full here by Minnesota Public Radio — was released by investigators just a few days after Yanez was acquitted on all charges related to Castile's death. During the trial, Yanez testified that he had to shoot since Castile did not comply with his commands and was reaching for his gun. But protesters said Castile's case — one of a number of high-profile deaths of black people involving police — wasn't about noncompliance. "The system continues to fail black people, and it will continue to fail you all," Valerie Castile told reporters after the Yanez verdict. "My son loved this city and this city killed my son and the murderer gets away." On the same day Yanez was acquitted, St. Anthony announced that he will no longer serve as a police officer there. News of the settlement comes a week after the family of Michael Brown — the 18-year-old African American shot dead by a white police officer in 2014 — settled their wrongful death lawsuit with the city of Ferguson, Mo. The terms of that settlement remain sealed.